In Closing Arguments, Defense Argues Manning Is A Whistleblower : The Two-Way Pfc. 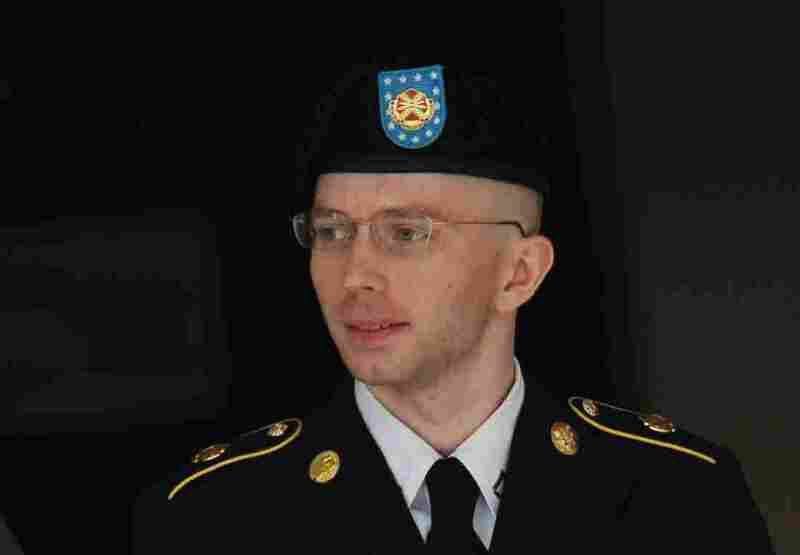 Bradley Manning, argued the defense, released classified information in an attempt to spark debate about things he found troubling about war and American diplomacy. Army Pfc. Bradley Manning is escorted from court on Thursday in Fort Meade, Maryland. Army Pfc. Bradley Manning was not aiding the enemy when he leaked the largest cache of classified information in the history of the United States, the defense argued today during closing arguments of his military trial in Fort Meade, Maryland, today. Instead, he released the information in an attempt to spark debate about things he found troubling about war and American diplomacy. CBS News reports that Manning's civilian defense attorney David Coombs said Manning is a whistleblower not a traitor. "Coombs said the prosecution cherry-picked Manning's chats with convicted computer hacker Adrian Lamo to make their case. He urged the judge to read the entire chat log to put things in context. "Coombs pointed out Manning also wrote, 'Hypothetical question: If you had free reign over classified networks over a long period of time, if you saw incredible things, awful things, things that belonged in the public domain and not on some server stored in a dark room in Washington, D.C., what would you do?'" As we've told you before: Manning has already admitted that he gave classified information to WikiLeaks. But he has denied the most serious charge he's faced with: aiding the enemy, a charge punishable by life in prison. At issue in this case is whether Manning knowingly provided intelligence to enemies of the U.S.
During their more than five-hour closing arguments yesterday, prosecutors argued Manning was reckless and that he released information to WikiLeaks — instead of traditional news outlets — because he wanted the data to be available in an indiscriminate manner. The closing arguments are still ongoing. We'll update this post with more a little later on. Manning's fate will be decided by Army Col. Denise Lind, a military judge. Manning requested a judge decide his case instead of a jury. Bradley Manning's fate is now in the hands of Army Col. Denise Lind, the military judge presiding over the case. "Lind will deliberate over the weekend and will give a day's notice ahead of her verdict," ABC News reports. "Once a verdict is announced the sentencing phase of the court martial is scheduled to begin next Wednesday."